At the west end of Shelter Island, near the entrance to San Diego Bay, you’ll find a testament to the enduring friendship that has been established between San Diego and Yokohama, Japan. The Yokohama Friendship Bell by Masahiko Katori connects these two port cities located on opposite sides of the Pacific Ocean. Large bronze bell housed in a pavilion structure. Learn: This 6-feet tall, 2.5-ton bronze Friendship Bell was presented to San Diego by the citizens of Yokohama in May 1958 as part of the Centennial Celebration of formal relations between Japan and the United States. 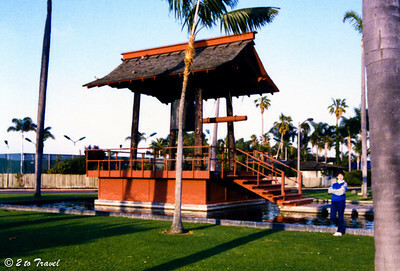 The words “Bell of Friendship” are inscribed on it in both English and Japanese, commemorating the Sister City relationship between San Diego and Yokohama. Like other traditional Japanese bells, the metal Friendship Bell has no clapper inside. Instead, a large wooden ram is pulled back with a lanyard and then released; this bell stick collides with a specially raised surface on the bell and…clang! The bell house design is typical of those found in Japan; open on four sides and surrounded by a moat. “We’re honored to have the opportunity to preserve the friendship and goodwill of both cities in the form of public art,” praised Allan Tait, the Port of San Diego’s public art project manager. A bell is an appropriate way to honor port cities as bells have long been one of the imperatives of safe navigation at sea. The sound resonation properties of bells have long-inspired scientific and engineering interest in underwater acoustics. In the 19th century, bells help thwart the dangers of fog and darkness to maritime commerce. Think about it…the night could easily conceal the whereabouts of hazards; maneuvering ships close to shore in the dark was a dangerous undertaking. 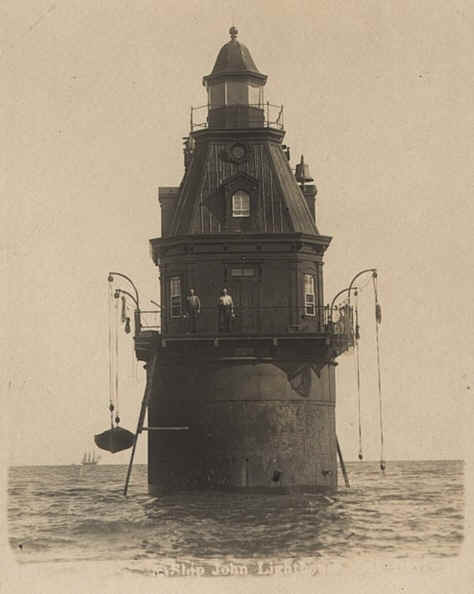 The growing use of lighthouses and vessel lighting during the 19th century, coupled with the advent of arc lighting alleviated part of the problem; but there was still another organic problem – fog. Fog can cloak hazards any time of day or night, obscuring visual clues like coastal landmarks, lighthouses, shipboard lights, reefs, shoals, rocks, or other ships. With sight gone, science focused on sound. Lighthouses and ships were equipped with bells or horns to alert mariners to nearby hazards. Despite the use of sound signals, losses to shoals, rocks, reefs, and inter-ship collisions were considerable. Steam power arrived and ships became bigger, faster and more plentiful. Navigations solutions were in order. In 1826, while floating on Lake Geneva on two boats, the Swiss physicist J. D. Colladon and the French mathematician J. K. F. Sturm first measured the speed of sound in water. The results astounded scientists and engineers: sound travels four times faster in water than in air. The acoustics of the newly-invented telephone expanded the paradigm for detecting acoustic signals in water. The transmitter on the telephone was also a sensitive electromechanical model that converted acoustic waves to electrical signals. The 20th century brought the first sonar-like listening devices < used to detect icebergs. Technology blossoms during adversity; during World War I it was a need to detect submarines. At first, these sonar sets could only “listen” to returning signals but by 1918, Britain and the United States had built sonar sets that could send out, as well as receive, sound signals. The U.S. military began adopted the term “sonar” during World War II, taking the name from the first letters of “sound navigation ranging.” Sonar can detect and locate objects under the sea by echoes, much as porpoises and other marine animals navigate using their instinctual gifts. 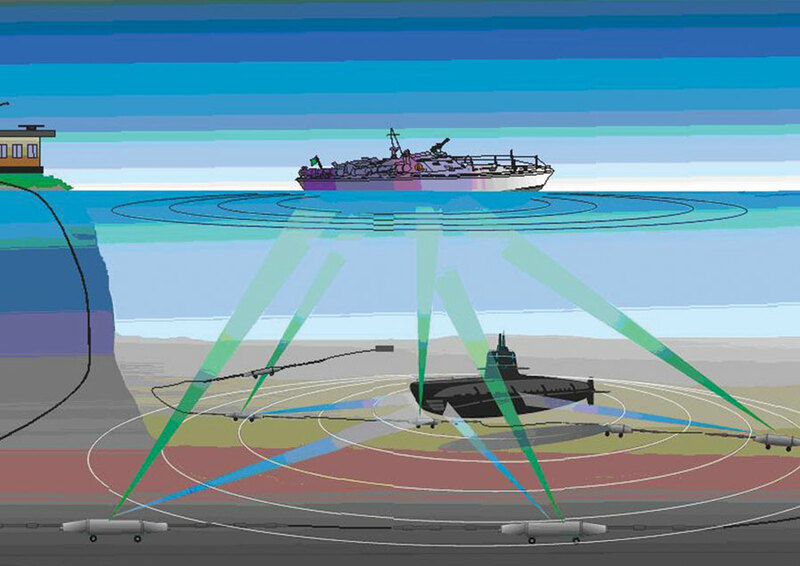 Active sonar reveals the presence and position of the operator, and does not allow exact classification of targets. It is regularly used by fast (planes, helicopters) and by noisy platforms (most surface ships) but rarely by submarines. When active sonar is used by surface ships or submarines, it is typically activated very briefly at intermittent periods to minimize the risk of detection. Consequently, active sonar is normally considered a backup to passive sonar. In aircraft, active sonar is used in the form of disposable sonobuoys that are dropped in the aircraft’s patrol area or in the vicinity of possible enemy sonar contacts. Passive sonar is stealthy and very useful. It is silent and surveys around the ship using it. It can determine the type of engine and the target’s trajectory. On a submarine, nose-mounted passive sonar detects in directions of about 270°, centered on the ship’s alignment, the hull-mounted array of about 160° on each side, and the towed array of a full 360°. The invisible areas are due to the ship’s own interference. Bells were originally used under what kind of maritime conditions? Why is water more effective than air for transmitting sound signals? What does the word SONAR stand for? Explain the difference between active and passive sonar. What does the Yokohama Friendship Bell commemorate? Check out bell sounds on your phone. Play telephone by whispering secrets down the line. Count how many heel-to-toe steps it takes to circle the Friendship Bell pavilion. The earliest archaeological evidence of bells dates from the 3rd millennium BC, and is traced to the Yangshao culture of Neolithic China. The earliest metal bells, with one found in the Taosi site and four in the Erlitou site, are dated to about 2000 BC. Early bells not only have an important role in generating metal sound, but arguably played a prominent cultural role. Bells are either fixed in position (“hung dead”) or mounted on a beam (the “headstock”) so they can swing back and forth. (The U.S. Liberty Bell Bells is hung on a headstock.) Bells that are hung dead are normally sounded by hitting the sound bow with a hammer. The striking technique is employed worldwide for some of the largest tower-borne bells, because swinging the bells themselves could damage their towers.